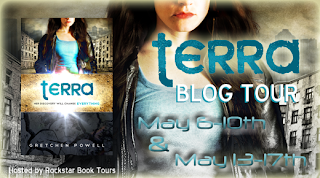 Thanks to Rockstar Book Tours, we're bringing you a guest post by Gretchen Powell, author of Terra, and an awesome giveaway! Keep reading for more information, and make sure to visit the other stops on the tour for more excerpts, interviews, and reviews! Chapters 1 & 2 are available to read online! 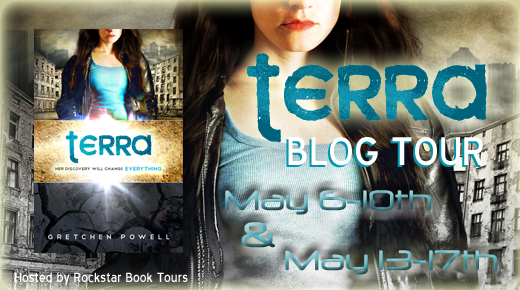 What was your inspiration for TERRA? I read far more than my fair share of dystopian fiction, so I figured it was only natural that I write something in the same genre. You know, go by the whole "write the book you'd want to read" mantra and all. I guess my main inspiration was a conversation I had with my brother. You know, the kind of "So... I have this idea... I think it would make kind of a cool book..." kinda thing. And that idea really transformed and became something entirely new and different once I actually started writing. What kind of research did you have to do for the world-building for the story? I can't really say specifically what my writing process is like, because it changes every single time! Sometimes I am laying on my bed, sometimes it's at my desk, sometimes it's in a crowded coffee shop. I think the constant changing up of things is what helps keep me inspired, actually. I will say that generally, though, my writing inspiration tends to come at night (in the middle of the night, really, which is quite inconvenient to my work schedule, haha) and the one thing that doesn't change is that I CANNOT listen to music. I've tried so many times, cause you hear about all these awesome stories of specific songs or playlists that authors used, but I just can't listen to any music at all. I end up trying to actually listen to the music too much! If you can tell us without spoilers, what was your favorite scene to write? What was the most challenging? My absolute favorite scene (well, scenes, really) come toward the end of the book. You'll know them when you get to them, because they're some of the most action-packed and adrenaline-pumping scenes in the whole book! I find that writing action is really what excites and motivates me. Conversely, all of my most challenging scenes came in the in-between parts. Trying to link together significant action-driven or character-developing scenes with the little filler bits was definitely the hardest part for me. Usually, I'd just end up skipping ahead to the next exciting part and then just trying to fill in the gap later on. 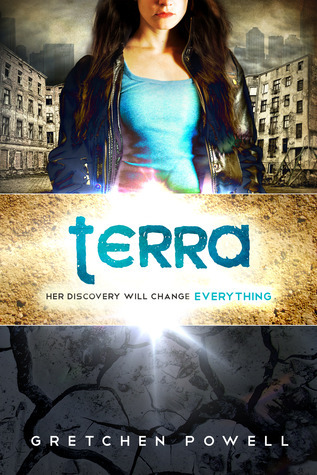 In honor of our blog's name (The Best Books Ever), tell us: what's the one book that you would recommend that everyone move to the top of their to-read piles (other than TERRA, of course!). I love this question! Well, I imagine that if your blog readers devour books as voraciously as I imagine they probably do, many of them have already read this book. That said, it is still far and wide the BEST book that I have read in the last few months: The Fault in Our Stars by John Green. That book absolutely DESTROYED me in the best possible way. Two incredibly enthusiastic thumbs up... I kinda want to read it again now. Half-Chinese and the daughter of a US diplomat, Gretchen Powell spent her childhood growing up in far-off places. She made it all the way to her mid-twenties whilst maintaining her deep-seated love for young adult novels, so she decided to write one of her own. Her creative process involves copious amounts of Sour Patch Kids and sleeping fitfully. Her many interests include anything with polka dots, Harry Potter, and playing the ukulele. When she isn't crafting devastated futuristic worlds and fiery heroines, Gretchen also writes a healthy living blog, entitled "Honey, I Shrunk the Gretchen!" 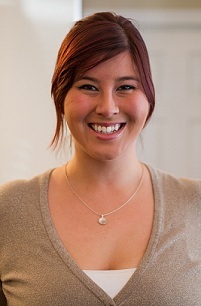 She lives in Northern Virginia with her two adorable miniature schnauzers. They wear many sweaters. First, what a great concept! And I would rather live on the ground. Mostly because (and I'm a worrier) of all the things that could go wrong. You could come crashing to the ground and everyone dies or is hurt really, really bad. I would want to live on the ground, mainly because I have a fear of heights! On the ground, for sure. So scared of heights, so definitely city on the ground! If the world is the same world like in the book I would definitely pick to live in a city in the sky. Because the earth was decimated from a plague and I wouldn't want to take a chance of any lingering disease. To me I would feel safer. I've been DYING to read this book!! I entered another giveaway to win this book and I am so excited to have another chance to win it. Thank you so much for this awesome giveaway!!! I am not really afraid of heights (just of ladders), so I'll say city in the sky!! Unless you have to climb up and down a lot of ladders.